Jim joined G&W in mid-2013 and brings more than 20 years of healthcare and pharmaceutical experience in public and privately held companies, as well as government agencies. 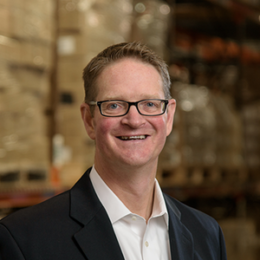 As Chief Operating Officer, Jim is responsible for delivering best-in-class customer service via G&W’s pharmaceutical manufacturing network and partner alliances. Jim works closely with the Company’s corporate development team in identifying and executing value-enhancing business combinations for both G&W and its Partners. Leading to Jim’s current position he served in various roles as VP, Supply Chain, New Product Launch and Alliance Management, and recently as the Chief Integration Officer where he successfully integrated the acquisition of manufacturing facilities, and business combinations such as in/out licensing deals and other partner arrangements. Prior to G&W, Jim held many positions at Teva Pharmaceuticals in Internal Audit, Supply Chain, Commercial / Technical Operations, and Distribution & Logistics. In his last position as Senior Director of Strategic Management & Operations Support, he was responsible for leading many of the Company’s strategic Technical & Commercial initiatives across the Company. Prior to Teva, Jim was a Manager in KPMG’s Risk Advisory Service Practice, responsible for assurance / attestation audit work, Information Technology Consulting / Auditing, and was one of six nationally designated resources dedicated to managing and delivering due diligence for Chief Executives considering future mergers and acquisitions. His healthcare / pharmaceutical experience started when he was a Supervisory Auditor for the Department of Health & Human Services, responsible for supervising and delivering audits of Managed Care Organizations, Providers, and Third-Party processors operations and compliance with Federal and State healthcare regulations. Jim earned his B.S. Accounting from The Pennsylvania State University. Jim enjoys spending time with his family and paying it forward through various athletic organizations as either a coach / instructor, board member and most recently as an Alpine Official for the Pennsylvania Alpine Racing Association.